Sometimes when a subsequence file, that has been created by an version of MacVector prior to MacVector 11, has been stored on a remote filesystem or has been emailed MacVector will refuse to open the file. Mac files are generally comprised of two pieces: A data fork and the resource fork. Prior to the release of OS X Leopard (and OS9 and earlier) used two pieces of information called TYPE and CREATOR to specify which application would be used to open a document. This information was stored within the resource fork. The resource fork has been lost from the file during the transfer, or more accurately due to it being stored on a non-HFS filesystem which only recognises the data fork. With older versions of MacVector this would have required the resource fork to be recreated and a new TYPE/CREATOR information to be specified and stored within the new resource fork. However, one of the many major changes made to OS X as been the move from the traditional way of opening files using the resource forks TYPE/CREATOR information stored within the resource fork to the use of Universal Type Identifiers (UTI) and file extensions. MacVector now registers many file extensions with OS X when installed. For example “.nucl” is a single NA sequence and “.renz” is a restriction enzyme file. 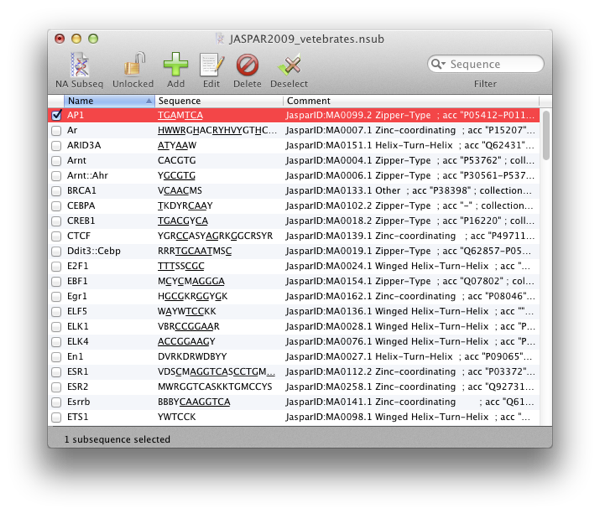 NA subsequence files have the “nsub” extension. If a file is missing the resource fork then OS X will rely on the file having an extension on whether it can open it or not. So fixing your subsequence files is as easy as literally adding the “nsub” file extension to your file. Do remember though that MacVector will always try its hardest to recognise a file’s format. So even if double clicking on a file will not open it (it’s the operating system that’s at fault here, not MacVector) then using FILE > OPEN from within MacVector will generally work. Saving that file will then recreate the resource fork AND add the extension. This entry was posted in Tips and tagged subsequences. Bookmark the permalink. Both comments and trackbacks are currently closed.